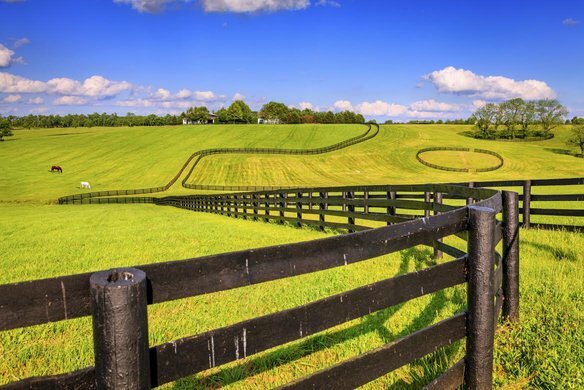 There are many safety concerns when bringing your horse home or to a new boarding facility, but one of the most important things you should be looking for is the type of fencing. Wooden fences are highly visible and strong; however, they can be expensive to install and require regular maintenance. If you have cribbers on the property, horse teeth can easily damage wood – meaning regular repair and replacement will be necessary. When it comes to wire, you have several options, including woven, V-mesh, and smooth. Woven is inexpensive, but not highly visible. Consider a top board or electrified tape at the top. V-mesh is an incredibly safe option, built in a diamond pattern that keeps other animals out and your horses in. Smooth wire fences are extremely difficult for horses to see and need to be supplemented with white PVC or electric tape to keep horses from leaning on it. PVC is one of the most attractive options for horse fencing, but it can be very expensive and easily breakable. Use it in conjunction with electrical fencing to keep horses from leaning on it and reduce its chance of breaking. Pipe can be expensive and difficult to modify once installed. It is very durable and strong, but will not give if a horse runs into it or attempts to jump over it. Most horse owners choose to use electric fencing along with other types of fences, or by itself. Electrical wire and tape are the most inexpensive option for fencing and they increase your chances of keeping your horses safe inside and discourage them from damaging fencing by leaning or chewing on it. This entry was posted on Friday, August 21st, 2015 at 11:42 am. Both comments and pings are currently closed.